Instagram/kelc33The Icelandic actor is 6 feet 9 inches and weighs 395 pounds. Photos of The Mountain from "Game of Thrones" and his Canadian girlfriend have fascinated Instagram users. He is 6 foot 9 inches, while she is reportedly just 5 foot 2 inches. The pair met reportedly met in September. 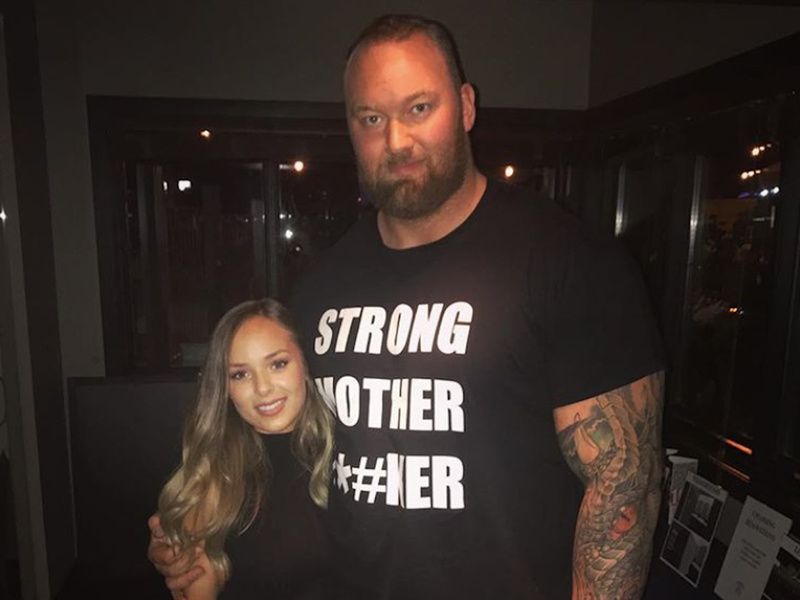 Photos of Icelandic actor Hafþór Júlíus Björnsson, better known as The Mountain from "Game of Thrones," and his Canadian girlfriend Kelsey Henson have gone viral because of their extreme height difference. The actor is 6 foot 9 inches and weighs 395 pounds, while Kelsey Henson is just 5 foot 2 inches, TMZ reports. The pair recently visited Iceland together, where the actor "introduced" her to the country. The extreme height difference prompted one Instagram user @destinyezurs to ask: "How do you kiss? Do you jump in his arms every time and wrap your legs around his waist? Please post a picture of this impressive action [sic]"
To which Henson appears to have seen the funny side. "Hahha he bends, I tip toe. Or just say screw it pick me up," she responded. Henson, who is an occupational therapist also posted this "throwback" photo of the pair in Benidorm, Spain. Instagram user @nikchantal_commented: "His hand is bigger then your head." The pair reportedly met in September in Alberta, where Henson was working at Earls Kitchen + Bar and he was in town for a Strongman competition, according to TMZ. She shared a photo of their meeting and wrote: "Met Hafþór [sic], AKA The Mountain, from Game of Thrones!!" Most recently she posted a snap of herself while exercising with a top that said: "Training to Fight the Mountain."